Lovely lizards. In the reptile world, there are some bizarre shapes and colors, but some of the most striking variations are found in the chameleons. These colorful lizards are known for their ability to change their color; their long, sticky tongue; and their eyes, which can be moved independently of each other. Get a handle on it. Chameleons spend their life in trees and bushes. Most lizards have five toes, but the chameleon's five toes are modified into groups: on the forefoot, the two outside toes are joined to form one group, and the three inside toes form another; the hind foot has the opposite arrangement. This allows them to grasp branches just like our thumbs and fingers can grasp objects. The chameleon's tail also helps with life up high: most have a prehensile tail that can wrap around tree branches while climbing. For this reason, the chameleon's tail cannot be broken off and regrown like those of many other lizards. The eyes have it. The chameleon's eyes are the most distinctive among reptiles. Each eye has a scaly lid shaped like a cone, with only a small, round opening in the middle for the pupil. 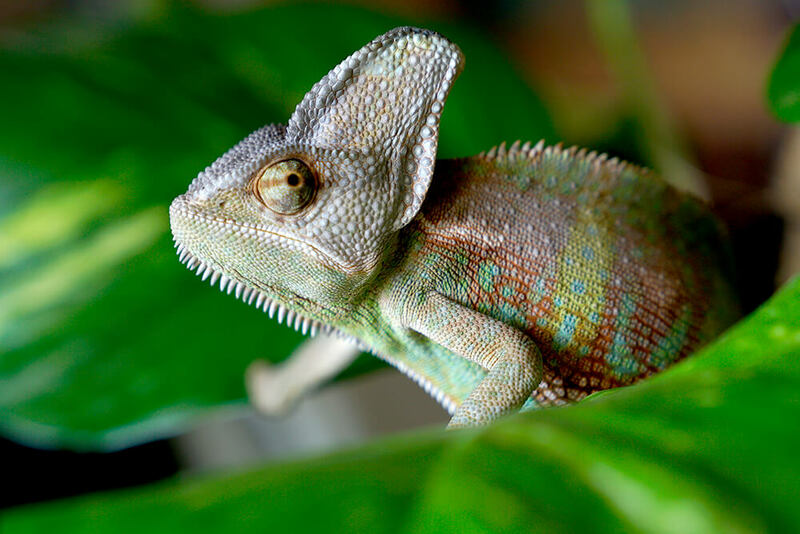 The chameleon can rotate and focus its eyes separately to look at two different objects at the same time! This gives it a full 360-degree view around its body. When the chameleon sees prey, both eyes can focus in the same direction to get a clearer view. The skinny on skin. How chameleons change color is a fascinating and complicated process. First of all, they don't really change color to match their surroundings, and they cannot change to any and all colors. For example, if a chameleon is sitting on a red-and-white polka dot tablecloth, it will not turn red and develop round, white spots! Chameleons don't look at what they're sitting on and deliberately decide to match it. Instead, each chameleon species has a group of patterns and colors that it is able to display. Chameleons have four layers of skin: the outer, protective layer, called the epidermis; the chromatophore layer, which contains yellow and red pigments; the melanophore layer, which has the dark pigment melanin and can create brown and black colors or reflect blue; and the nether layer, which only reflects white. Nerve impulses and hormone changes cause the color cells in these layers to expand and shrink, and the blending of the different layers creates the colors and patterns that we see. 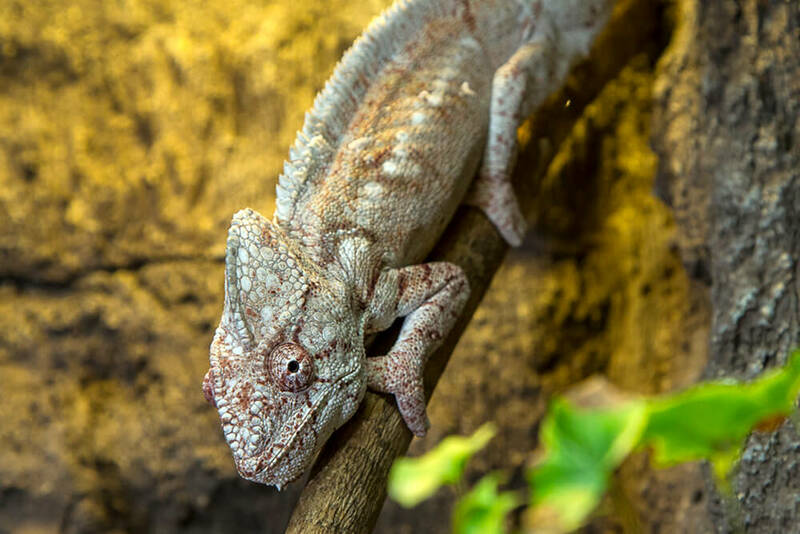 Through the field of bioinspiration, scientists and engineers are digging deep to discover what chemical and biological mechanisms allow chameleons to change color. So far, a prototype T-shirt that changes color has been created with the same process that the chameleon uses. A water-catching casque. The veiled chameleon is a large chameleon species found in the mountain regions of Yemen and Saudi Arabia where there is very little water. Males and females differ greatly in size, with the males being much larger, although both have a decorative growth on their head that looks like a party hat but is called a casque. The casque acts like a water collector: at night, droplets of moisture roll down the casque and into the chameleon's open mouth! Males also have a spur on each hind leg. Veiled chameleons are omnivores, eating insects, leaves, and flowers. Female veiled chameleons can produce three clutches of eggs a year. Each clutch may have 20 to 70 eggs and take 6 to 9 months to hatch. The Thiel`s dwarf chameleon from Madagascar is one the world's smallest - reaching no larger than two inches in length when fully grown. Little mysteries. Brookesia is a chameleon genus found in Madagascar and its members are considered the world's smallest chameleons. Brookesia chameleons have a short, non-prehensile tail. Most species in this genus were only identified to science within the last 30 years and do not even have common names. Due to their small size and secretive nature, they have not been studied as much as their larger relatives. There are currently 26 recognized species in the Brookesia genus. We still have much to learn about these amazing lizards! Where is home? All chameleons are found in the Old World, but most live in Madagascar and Africa. The rest are found in the Middle East, a few on islands in the Indian Ocean, and one, the Indian chameleon, in India, Pakistan, and Sri Lanka. Another, the common chameleon, is native to Spain, Portugal, the islands in the Mediterranean Sea, and the Near East. Chameleons live in a variety of habitats, from rain forests and lowlands to deserts, semi-deserts, scrub savannas, and even mountains. Many inhabit trees, but some live in grass or on small bushes, fallen leaves, or dry branches. Namaqua chameleons live in Africa’s Namib Desert, where they dig holes in sand dunes to escape the extreme heat and cold. Sail-fin chameleons inhabit the montane forests of Cameroon, in West Africa, where mountains rise to cloud level and are shrouded in fog; it’s a cool, wet, dripping place of little sun. Fast firing tongue. Chameleons generally eat insects such as locusts, mantids, grasshoppers, stick insects, and crickets. Some larger chameleons also eat small birds and other lizards. A few species have been known to eat a bit of plant material. Chameleons don't move around very fast, so they use their incredibly long tongue to catch the insects they eat. They are able to stick the tongue out of their mouth very quickly. The tongue has a sticky tip on the end to snag prey items that they would otherwise never be able to catch. The end of the tongue is a ball of muscle, and as it hits its prey, it rapidly forms a small suction cup. Once the prey sticks to the tongue, the chameleon draws it back into the mouth, where its strong jaws crush it for swallowing. Even small chameleons are able to eat large insects. The tongue is kept bunched up at the back of the mouth until it is needed again. The biomechanics of the chameleon’s tongue are of great interest to the field of bioinspiration. The chameleon's changing skin color plays an important role in communication among individuals. It changes under the influence of the lizard's mood, such as fear or anger, the amount of light, and the temperature or humidity. Males that can make themselves brighter are more dominant and attract more females. A submissive male displays brown or gray. Females use their colors to accept or reject a male; their color display can also signal a pregnancy. Nesting instinct. Most female chameleons lay eggs. The number of eggs laid varies among different species. When the eggs are ready to be laid, the female climbs down to the ground and digs a hole. She deposits the eggs in the hole, buries them, and leaves the nesting site. During incubation, the eggs absorb water from the earth and can gain up to 0.14 ounces (4 grams) in weight. There are a few chameleon species, such as the Jackson's chameleon, that are viviparous. A few days after the young hatch or are born, they begin to hunt insects. They instinctively know how to survive without a parent to teach them. The hatchlings look like miniature adults, except that their coloration and markings are not as bright. They grow quickly, and many species reach sexual maturity before the end of their first year. The Jackson's chameleon is native to the humid, cooler regions of Africa's Kenya and Tanzania. It is usually found in great numbers in mountainous areas. One subspecies was introduced to Hawaii in the 1970s and has since grown into a large, feral population. The Jackson's chameleon is a small- to medium-sized chameleon best known for its sawtooth-shaped dorsal ridge. The female Jackson's chameleon is one of the few chameleon species that give live birth instead of laying eggs—from 8 to 30 live young after a 5- to 6-month gestation period. Jackson's chameleons are sometimes called three-horned chameleons because males have three brown horns (the females usually have no horns). The horns are used to defend territory. On a narrow tree branch, males may lock horns and try to push the other off. Jackson's chameleons are usually bright green, with some traces of blue and yellow, and are usually less territorial than most species of chameleons. A colorful past. In 1965, the San Diego Zoo’s first chameleon’s arrived: Parson’s and Madagascan flap-necked chameleons. Jackson’s chameleons entered our collection in 1971. 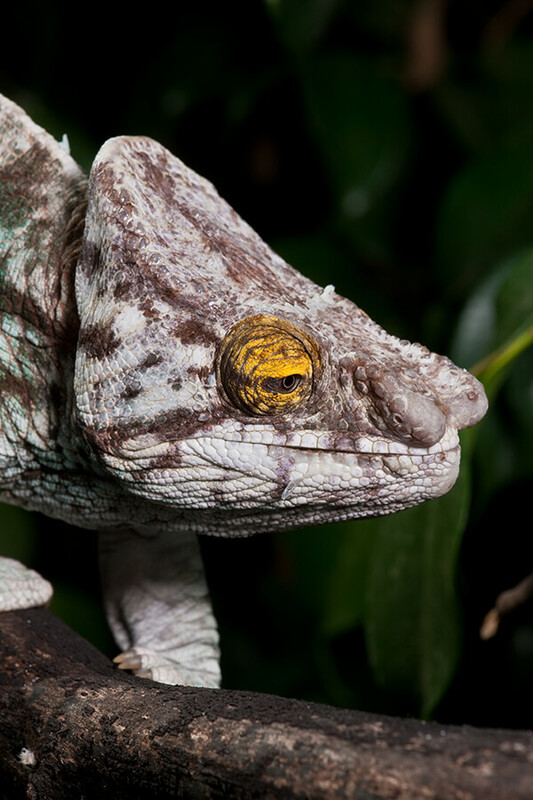 The Zoo received its first two pairs of veiled chameleons in 1990. A month later, we acquired another pair, and soon realized that two of them cannot be kept in the same enclosure. In fact, males cannot be within sight of each other from any distance, because they continually threaten one another, creating too much stress to keep them healthy. All six gained weight quickly, but one female kept on growing. After a few months, it was obvious that “she” was really a male. We called him the Hulk. Later that year, we welcomed our first hatchlings: 34 babies emerged from 54 eggs laid. We may have been the first zoo to exhibit and breed veiled chameleons in the US. Madagascar is home to nearly two-thirds of all chameleon species. Three of those species— Belalanda chameleon Furcifer belalandaensis, bizarre-nosed chameleon Calumma hafahafa, and Namoroka leaf chameleon Brookesia bonsi—are at critical risk, losing their habitat to slash-and-burn agricultural practices, logging for construction or charcoal, and cattle grazing. Loss of habitat affects other chameleon species as well, as does collection for the pet trade. Sadly, many chameleon species do not do well in captivity. Number of young: Small species lay 2 to 4 eggs, large species lay 80 to 100 eggs. Species that give birth to live young produce 8 to 30 young. The egg of the rare Parson's chameleon is believed to take up to two years to hatch. A chameleon's tongue can be shot out to an extraordinary length: in some species the tongue is longer than the body. Chameleons seem to prefer running water to still water. The name chameleon means earth lion and comes from the Greek words “chamai” (on the ground, on the earth) and “leon” (lion). Chameleons shed their skin in pieces. How often they shed depends on how quickly they grow.